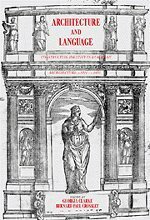 Architecture and Language examines one of the central themes in the history and theory of Western architecture. Seeking to understand how language provides a model for understanding architecture, the essays in this volume both celebrate the diversity of the language-architecture analogy and assess its theoretical implications in the light of the diverse historical circumstances that produced it. The chapters examine the connections between style and nationality, vernacular and "official" languages, the importance of Latin in giving the architectural profession a literate and cultured status, and the influence of architectural description on perception and design.